Erin and Travis met 5 years ago at the famous “Jamboree in the Hill” music festival in Ohio. It’s a 10-day concert that her parents attended in the 70’s, so Erin felt lucky that she too was able to go with her cousins and Aunt. While there she met Travis, who was camping beside them and they began dating afterward. On Erin’s birthday Travis planned a romantic date to a restaurant in Baltimore, where Travis took Erin out on the balcony and popped the question. Her family were in on the secret and appeared shortly after he proposed with balloons and a cake. Erin always knew she wanted to get married in Jamaica. Being the youngest of four, hosting a destination wedding would be something different than the traditional weddings of her siblings. Her family was fully supportive, and the idea of a vacation and wedding combined appealed to everyone. She began the process of getting legally married in Jamaica and planned to host a religious wedding at home later that year. 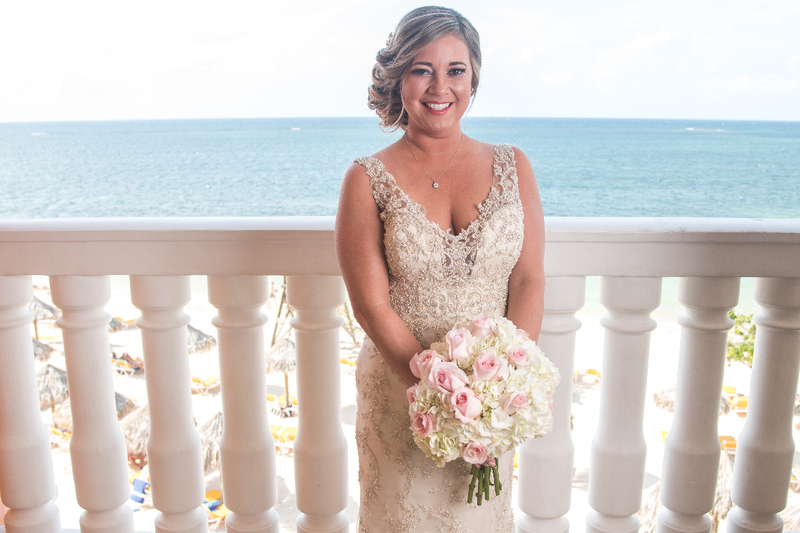 Together Erin and Travis worked with Destify, and their agent Melissa who helped them choose the Iberostar Rose Hall Suites. Melissa proved to be wonderful throughout the process. Erin said, “She made it so easy for me, she became my go-to person”. Melissa served as a liaison between her and the coordinator, answering many questions, as sometimes response time from the wedding department was slow. The wedding department did prove to be super helpful with their responses though, and the couple planned to bring many of their own decorations with them. Once on the resort grounds, the couple met with their coordinator to finalize their vision for the big day. That Friday night when most of the guests had arrived they hosted a bonfire on the beach, while the DJ they brought from home played tunes on equipment rented from Iberostar. On Saturday they hosted a rehearsal dinner at one of the resort’s restaurants, where everyone continued to get to know each other better. The couple chose Sunday for their wedding day, and in the early afternoon, Erin and her bridesmaids went to the spa to get ready in the bridal suite. The hair and makeup turned out great, everyone loved the results and Erin looked gorgeous. The couple said they were both nervous, for the entire day. That was until the first look. Travis said, “I felt like I could finally breathe after seeing her”. They took pictures before the ceremony which allowed them to enjoy the cocktail hour and private reception, which was a stunning set up under a covered tent on the beach featuring delicious food and a live steel drum band. As a way of saying “Thank you” to their guests, the couple rented out a bus that took everyone to Margaritaville on Monday, which served to be the perfect farewell bash. The couple spent their time wisely in Jamaica and even went off for the Honeymoon after in Negril. They recommend getting some days to yourself if it fits your budget. Erin’s advice is to relax if the response time is slow from your coordinator. The wedding departments know what they’re doing. Just make sure you’re always clear about your vision, and they’ll make it happen. My favorite part of the wedding was watching two families become one.